I also have a card that I didn't get to share last week. We have a lot of boys in our family so I always feel like I'm looking for a masculine card! It's such a challenge to create something festive but not boring or, even worse, girly;) That's why I was so happy to see the little guitar and drum stamps in the new Avery Elle We Go Together set:) Here's what I made with them! First I stamped a tone-on-tone background with the guitars. I used Fog ink on Fog card stock. Then I die cut the letters (using my Avery's Alpha dies) onto a triangle panel and stamped on the drum set. Part of the drum set continued over the bottom of the letter "Y", so I stamped it on the red backing panel and colored it in with a white pen. The last step was to paper piece the parts of the drum set and glue them on with foam tape. I colored the drums just a bit to match the gray background. Fun stuff! Thanks for popping in today! 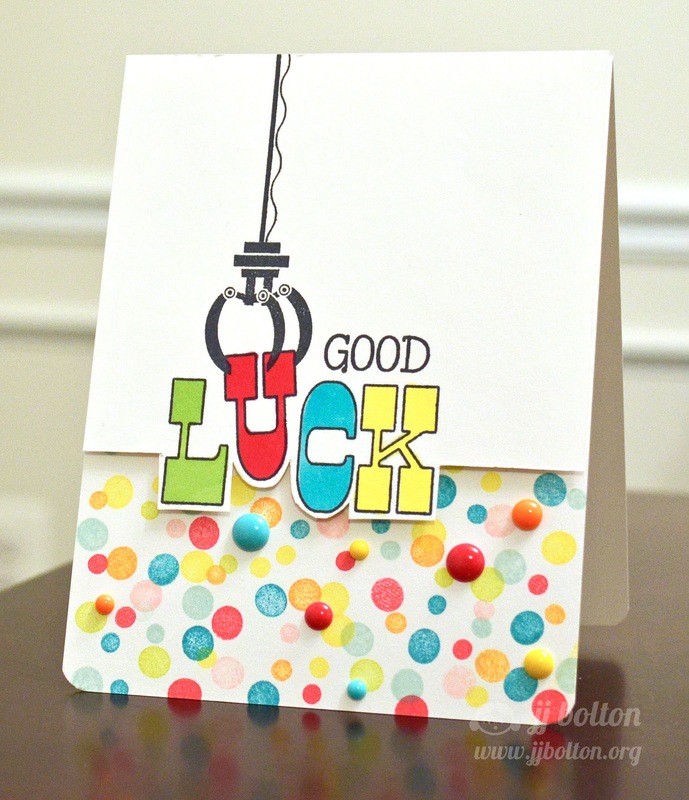 Please stop by Heather's blog and check out her cute card! 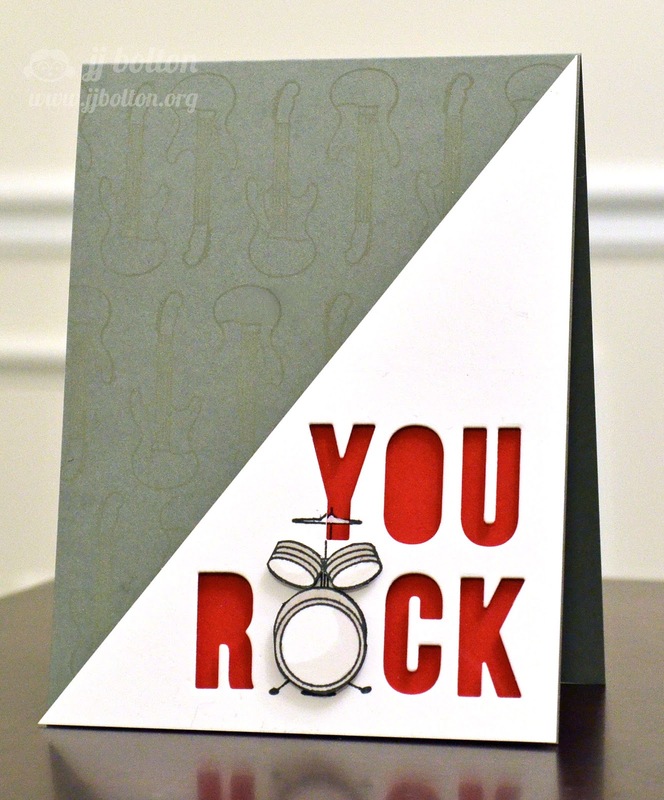 love the "you rock" card! so cute! That You Rock card is fantastic! Replace with R with a P and O with a pig and give it a whirl. Ha! Seriously so fun though! Totally and completely in LOVE with both cards! Lot of trendy goodness on both! Oh my gosh, I love BOTH of your cards equally!!! The way your cymbal crosses and continues across the letter Y is such a clever design!! You are the best at the tiny details like that which really make a card. Just awesome, JJ! 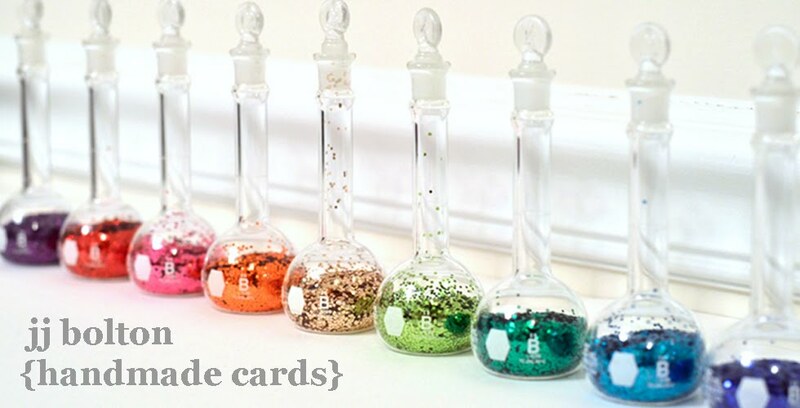 Such clever and fun cards, JJ! I love the happy colors on the first card and how you played with the guitar on the 2nd one! Very cool, and perfect for the 'teens' in your life! One perfect card... and when you think it can't get better, you scroll down only to find another genius one!!! Amazing, JJ! OMG! That you rock card is INCREDIBLE!!!!! Swoon! I have two little boys and I know cards for them in the future will be hard! What amazing inspiration! And the good luck card is so cool!! LOVE the dots and colors!! So so fun!! Absolutely fabulous, both cards. Everyone is so special. Love your fussy cutting skils. YOU ROCK! 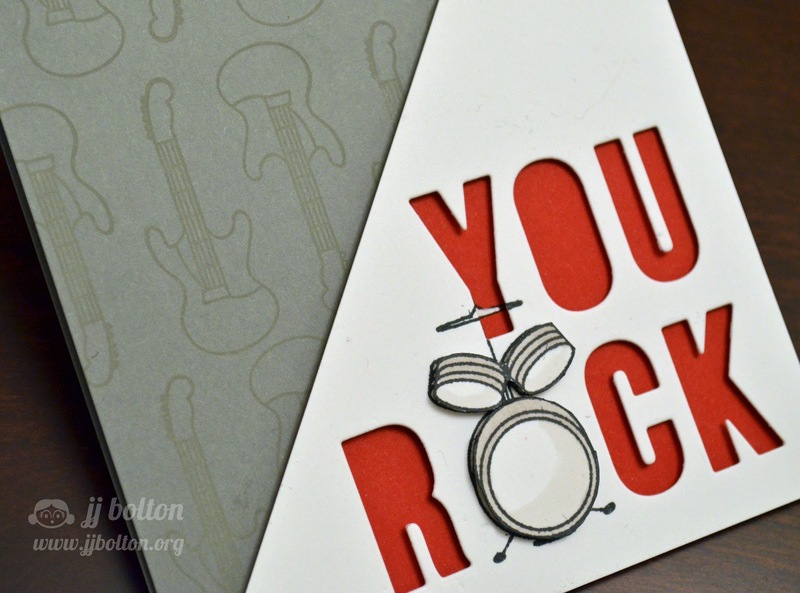 LOVE the fabulous drum set card!! Clever, clever cards!! Way to go - you captured my attention to your blog!! I really enjoyed perusing the creations you have made! I came across your blog from the Moxie Fab Blog Roll. I am glad I did you are awesome!! Dare I ask that you come by my blog for a peek - daisiesgirl.com! I would really love to see you!! I really like the way you cut the top 1/2 of the card around the word. It adds so much to the wow factor! It's been how long? And I'm still impressed with your clever ideas and fun and original take on ALL your projects.